Spórt Éireann ag lorg iniúchadh iomlán ar an FAI sula mbronnfar deontais an athuair. 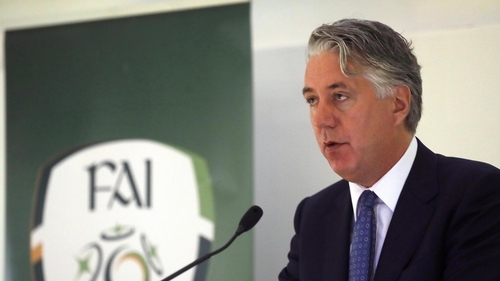 Iar-Phríomhfheidhmeannach an FAI John Delaney atá fostaithe anois ina Leas-Uachtarán Feidhmiúcháin. Braitheann sé freisin meastar ar chéard a thagann ón athbhreithniú atá ar siúl ag Mazars agus ag Grant Thornton. San ráiteas a thabharfaidh Spórt Éireann os comhair an Choiste amárach, ráiteas atá feicthe ag RTÉ, deirtear gur mór-údar imní ó thaobh rialachais agus maoirseachta é an cuntas atá tugtha ag an FAI ar stadas airgeadais na heagraíochta i 2017, tráth a deir iar-Phríomhfheidhmeannach an FAI John Delaney a dtug sé féin €100,000 ar iasacht dóibh. Ina theannta sin deir iar-Uachtarán de chuid an FAI go bhfuil sé in am ag "gach duine beo ar an mBord smaoineamh orthu féin." Tá Bord an FAI le cruinniú a bheith anocht acu. Deir Des Casey gur "eagraíocht réasúnta daonlathach a bhíodh san FAI, ach eagraíocht uathlathach anois iad." Deir sé chomh maith go bhfuil cáil an FAI truaillithe go dona, agus go bhfuil sé in an-chaoi agus faoi bhrón faoin tionchar a bheidh aige ar fad ar imreoirí, ar ógánaigh, ar oifigigh forbartha agus ar réiteoirí a bhfuil croí agus anam tugtha acu don sacar sa tír.